This was a new way of reading a book for me. It was all written in the form of letters or chats or personal messages and texts to each other. I think I only read 2 or 3 books written like this, but they are were just one person writing in her diary or letters to one person from one person. But somehow the writer made this all work. 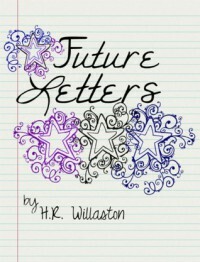 The book cover is also very fitting, considering the fact that the “idea” for the Future Letters, comes from someone young and in school. So you have these three besties, but also a guy, well more guys, and they are just good friends, even though two of the guys are much older, because they are brother and best friend of brother, but also cousin of the other guy, who is more the age of the girls. Their lives are so intertwined, that they keep in touch and help each other. When I got used to the way the story was being told, I thought ok, this is more a book I would let my daughter read. And I still would, but it does not only talk about teenagers and their dreams and crushes, it also touches some more serious stuff, like drinking and driving, and being responsible while drinking. It’s a good clean book with solid advice and I love it for all of this. True love, life after something devastating happens, nurturing talents and of course nurturing relationships.